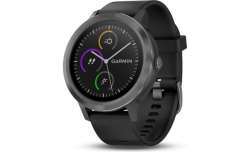 Garmin Vivoactive 3 Fitness Activity Tracker From playing to paying, vívoactive 3 is the smartwatch for your active life. Make contactless payments with ease, right from your watch, and with more than 15 preloaded sports apps you can choose how you like to get fit. Built-in GPS lets you record the distance, pace, location and more for your outdoor activities.